Who says there’s no new ideas in the land of the dead? The standard zombie tropes get twisted up with amnesia-like symptoms that alter the very perception of reality in the no-budget thinker Fugue State. I’m instantly intrigued. And there’s a teaser (which doesn’t really do the idea justice) after the break. Finally, for those following the Zombie Movie Marathon Month saga, the final film list, in rough order (possibly final, but may undergo minor sequence changes) is also after the break. 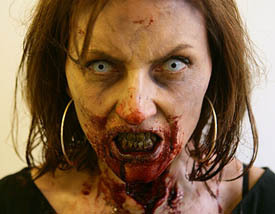 When we meet again, Zombie Movie Marathon Month will be upon us! June is almost upon us and that means it is time for me to get serious about finishing the list of movies for the June Zombie Movie Marathon Month festival. I had hoped to have the entire list done by now but for a variety of reasons — scheduling conflicts, inability to confirm that movies will be available, indecision — I haven’t been able to do so. I have come up with a preliminary list of definite movies to watch (although not the when, for the most part), a couple of themes to explore and a handful of “maybes.” Now I am taking commentary from you fine readers. Help me decide! My two themes are five days each of Italy and Japan. Italy has proven to be the easier of these, and comprises most of my “definite” list. Japan is a little trickier and I may put it to a vote next week (about time I used that poll for something, anyway). Apart from that there are a few seminal films that I have managed to not see yet and a few my daughter has managed to not see yet and those comprise the rest of what is definite. Okay, that’s where things stand at the moment. I’ve got ten nailed down, ten strong possibilities and a whole, long list of other stuff that I haven’t decided on. Comments and suggestions are welcome and encouraged. I mentioned before, briefly in a news post, the fact trumpeted in the headline above: June is the second annualÂ Zombie Movie Marathon Month! 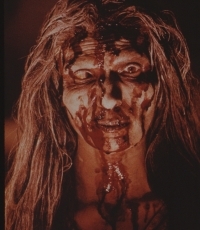 For the second year in a row, I will be watching a zombie movie every day for the entire month of June. I invite all zombie fans to join me — from the comfort of your own home — whether it be for the entire month, weekends only, a single week or whatever you can manage. I’ll be posting the entire schedule within a week (I hope) and you can join in with the same movies on the same days, the same movies on different days, or your own schedule. If you run a blog or web site and participate in any way, I will gladly link to you and/or any reviews you post in conjunction with the fest. 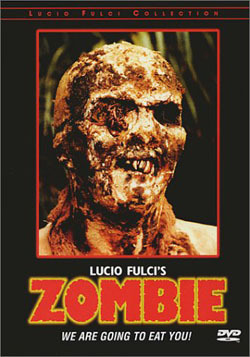 I will be doing a single public screening, of Lucio Fulci’s Zombie, on June 18 (details to come) if you happen to live in or near Denver. The rest will just be me at home (or wherever — actually planning on going camping in early June, so I’ll be watching in the woods somewhere!) every day. Last year I wasn’t able to make it every single day, so I doubled up other days. This year, I am going to do everything in my power to do one movie every single day. I am taking suggestions for movies to watch, so feel free to leave comments with ideas. During the fest I will be posting daily impressions and lots of movie reviews — hopefully as many as two-thirds of the movies I watch during the marathon (the rest will trickle out over the course of the following months as I finish and polish them). Finally, after the break I have posted a report I wrote last year on the marathon for the local paper I freelance for. It might have some interesting tidbits for regular readers.